Near and Far is one of those cookbooks that I’ve been anxiously waiting for since I read this post. Even though I’m not a vegetarian, I love plant-based dishes and have drawn from Heidi’s blog for culinary inspiration over the past few years. The dishes featured in this book are inspired by Heidi’s San Francisco home as well as travel to Marrakech, Tokyo, Paris, Jaipur, Rome, Kyoto, Palermo, and New Delhi. I love the stories behind the recipes as well as the beautiful photography of the aforementioned destinations. With regard to recipes, her dishes reflect her philosophy on making natural food delicious and feature lots of fresh fruit, vegetables, and whole grains. After perusing Heidi’s book, I had mad craving to create a meal with Middle Eastern influence so I made the red lentil hummus and harrisa farro from her book as side dishes to the lamb kofta that we usually eat. Traditionally, hummus is made with chickpeas so the use of lentil was quite clever. The combination of flavors through judicious use of spices made her dishes sing. The spring rolls were a hit even though they’re vegetarian. The addition of mushrooms made them filling and delicious. The one recipe that I was hoping to work is the whole wheat waffle since it’s something I’ve tried perfecting ever since we got a waffle maker but no luck. The waffles turned out a bit bland due to the lack of sugar and too much flour. There are so many more recipes that we can’t wait to try from Near and Far. The pozole verde, quinoa blini, lilikoi curd, and saffron lassi are next on the list. Another thing that I appreciated about this book is Heidi’s deliberate effort to keep the integrity of the regional ingredients and giving a lot of room for substituting seasonal ingredients. I also like the fact that many of the ingredients are available through Whole Foods and you don’t need to find a specialty store. By far, Near and Far is my favorite book from Heidi Swanson and also one of my favorite vegetarian books. I own over 200 cookbooks and this is one of three vegetarian cookbooks in my collection (the other two are Green Kitchen Travels and A Modern Way to Eat). I can’t rave enough about Near and Far. The photography, writing, and recipes are awe-inspiring. Even if you’re not a vegetarian, this cookbook will inspire you to seek out the freshest ingredients, explore different flavor combinations, and bring Heidi’s dishes to life. We love salsa at our house, especially the fruit salsa–cherry, strawberry, mango, and peach. These fruits seem to take on the lime juice and heat from the Serrano chiles quite well. The result is a refreshing and delicious salsa that pairs well with both meat and white fish. Cherry is our favorite because they hold up a lot better than the other fruits and have a nice texture if you can get your hands on the firmer ones. We enjoy cherry salsa with grilled chicken burger, grilled fish burger, and pan fried white fish. 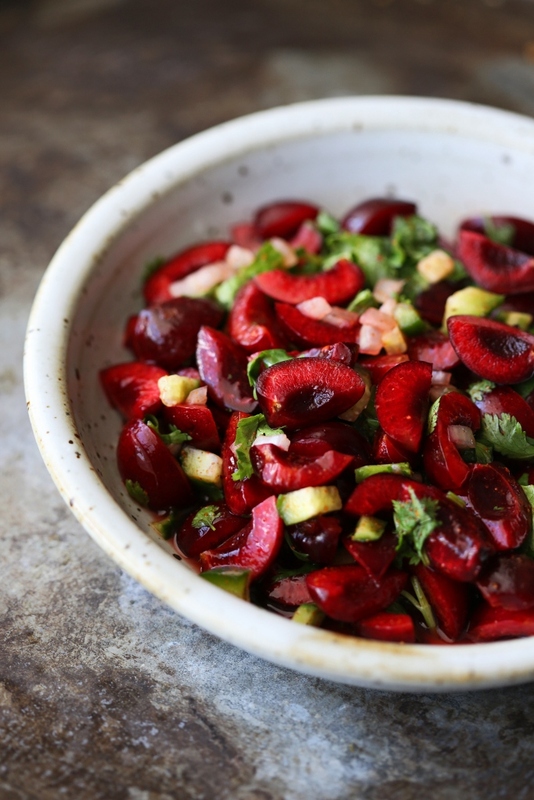 Grab some cherries and make this salsa before they’re gone! 1. 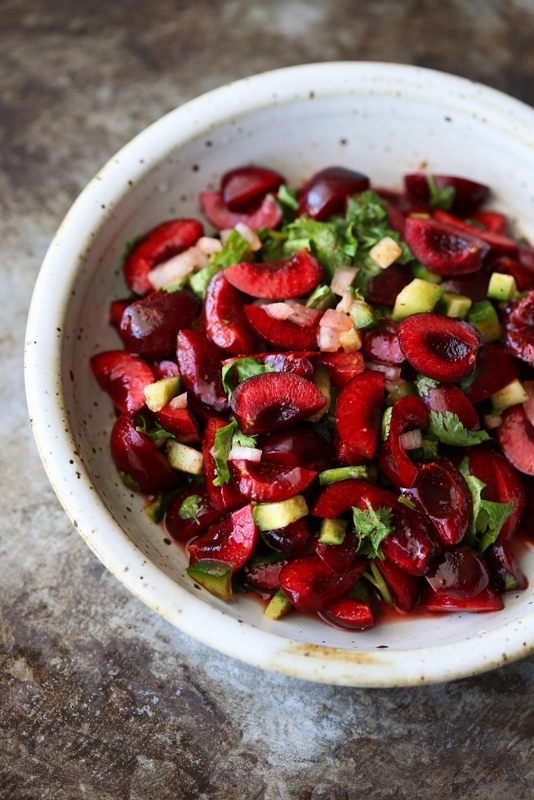 Combine cherries, cucumber, onion, Serrano chiles, cilantro, and lime juice a serving bowl and mix thoroughly. 2. Season with salt and pepper to taste. 3. Refrigerate until ready to serve. A Jewish Baker’s Pastry Secrets is a wonderful book from James Beard award-winning baker George Greenstein. The book teaches you everything you need to know about making bundt, babka, strudel, gugelhopf and Portuguese sweet bread, stollen and Polish Kolacz, puff pastry, Charlotte dough, and Danish pastries with more than 200 variations of classic pastries. It also has two chapters on basic techniques and recipe and equipment, tools, and ingredients. My only gripe is the lack of pictures in the this book. The only picture that you’ll get is the one on the cover. I would definitely be more interested in trying out the recipes if I know what my end product would look like. I would recommend flipping through the book at your local bookstore before committing to it. A Jewish Baker’s Pastry Secrets has a lot of good recipes and tips if you can get past the lack of pictures. If you had told me five years ago that I would be making my own granola, I wouldn’t have believed you! We eat quite a bit of granola at our house, usually for breakfast with milk and as a topping for yogurt and cottage cheese. We recently switched from store bought to homemade granola because of Aiden’s allergy. A few months back, we gave him a cluster of granola and he immediately broke out in hives. It was the only thing that he had eaten so I suspected granola as the culprit. Aiden has a milk protein allergy which predisposes him to hives, nausea, vomiting, diarrhea, and respiratory issues when he eats anything containing casein and/or whey. Sadly, he can’t have any milk or milk products–cow’s milk, goat’s milk, sheep’s milk, cheese, yogurt, and ice cream. Anywho, imagine my surprise when there were not just one but two things, dry milk powder and whey protein, on the ingredient list! DOH! We totally failed to read the label. Shouldn’t granola just contain rolled oats, nuts, seeds, and honey/maple syrup as a sweetening agent?! Why would dry milk powder and whey protein be incorporated in granola?! We still can’t figure it out but lesson learned! 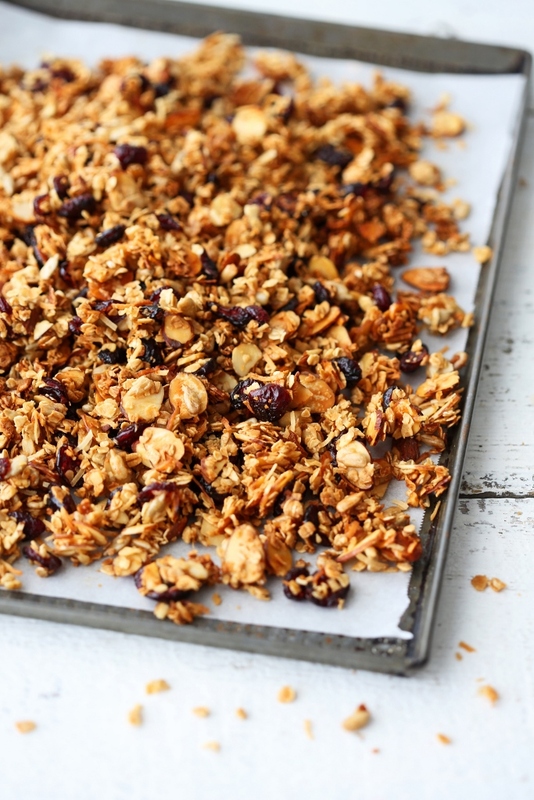 Since then, we started making our own granola and it’s a lot more easy than one imagines. Throw whatever you like in a bowl, mix, and toss it in the oven. Thirty minutes later, you have a delicious granola packed with healthy nuts and seeds for breakfast or a snack. We feel much better knowing that Aiden can enjoy homemade granola without an impending allergic reaction. 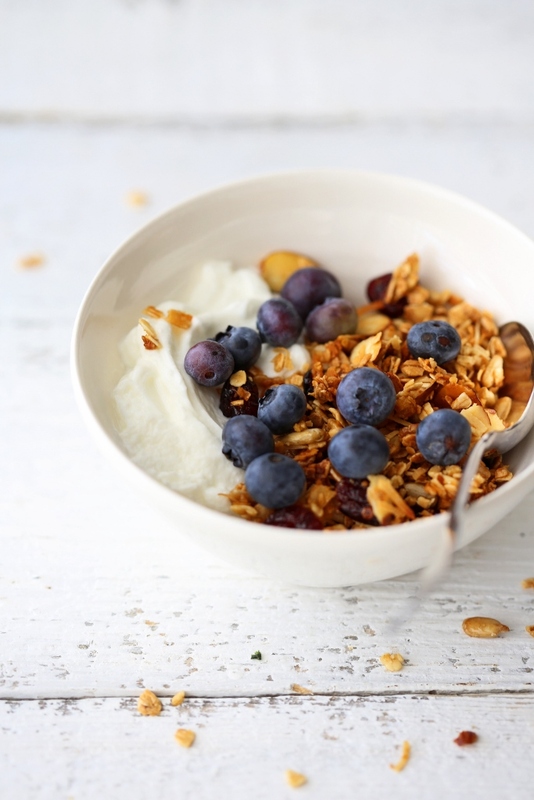 We’re sharing our basic granola recipe today that we often eat with yogurt but you can eat it whatever way you prefer. Enjoy! Just toss everything together and enjoy! 2. Place all the ingredients in a bowl and toss to combine. Make sure all the oats are moistened. 3. Spread evenly onto a baking sheet lined with parchment paper. 4. Bake in the oven for 30-40 minutes or until golden and dry, making sure to turn the granola every 10 minutes or so to ensure even color and to prevent it from sticking to the pan. 5. 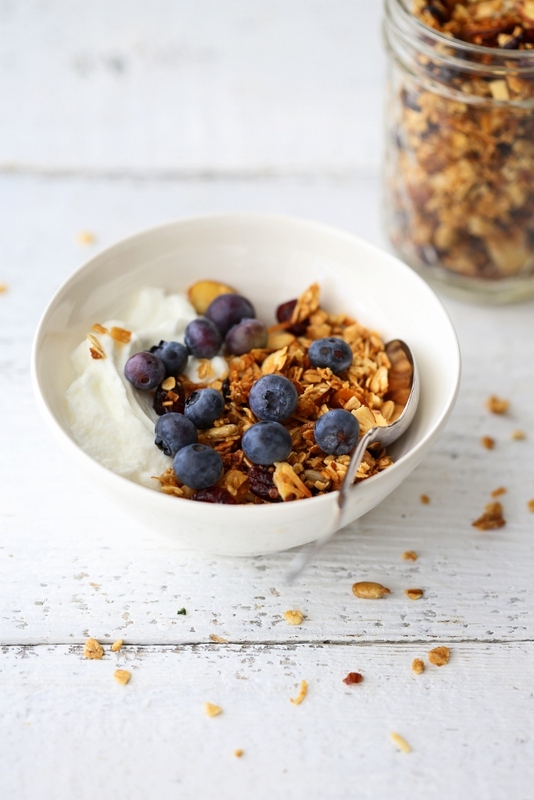 Set the granola aside to cool and crisp up. 6. Transfer to an airtight container and store up to a month.